Photoshop expert, Terry Steeley, kicks off the first of a new series of tutorials for ePHOTOzine that looks at how to watermark our digital images to protect them from being used without our consent. This method for watermarking your photos will allow you to create a 'Photoshop Action' that will place your watermark in the same place and at the same size automatically on all of your images. Aware that photographers produce images at different sizes, we will create our 'Watermark Action' to fit the smallest size of a 6x4in portrait image to ensure that our watermark will fit on all of our larger images. 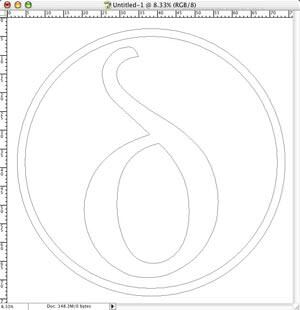 1 Firstly, we need to create a vector or path outline of the watermark to be used. This could be your company logo as used on your letterheads and business cards or even simpler, your company name in your favorite font. 2 In Photoshop, create a new document, Width: 3 inches x Height: 3 inches, Resolution: 300 pixels per inch (ppi) and the Colour Mode: Greyscale, Contents: White and click 'OK'. Note: This 'Canvas' has been created square to allow anyone with a round logo to make it as large as possible. 3 The next stage suggests two methods for creating a 'Custom Shape'. 3i, for anyone with a logo in a vector file format (Adobe Illustrator file or similar) and 3ii, for Photoshop users wanting to create their own watermark using the text tools. Open your vector logo in its native application. Using the 'Selection' tool, select the logo and if not already converted to an outline - do so (Depending on your vector application the command 'Convert to Outline' will vary). Choose from 'File' menu, 'Copy'. With the logo copied to the clipboard, move back into Adobe Photoshop. Paste the outlined logo into the newly created 3 x 3 canvas. If prompted, choose 'Path' from the 'Paste' options. Now, from the 'Edit' menu select 'Free Transform' and using one of the transform corners resize the logo to be as large as possible within the canvas (holding down the 'Shift' key to scale the logo proportionally). In the 'Options' bar, click the tick to accept the transformation. To add the shape the library, choose 'Define Custom Shape' from the "Edit' menu and name the item 'watermark'. Click 'OK'. Before continuing reset the default colours in the 'Toolbox' by pressing the 'D' on the keyboard. You should now have a black fill in the foreground swatch. Select the 'Text' tool (T) from the 'Toolbox'. Now, select a font from the 'Options' bar and a font size - we have chosen to use 'Impact' and 40pt, and text alignment 'Center Text'. 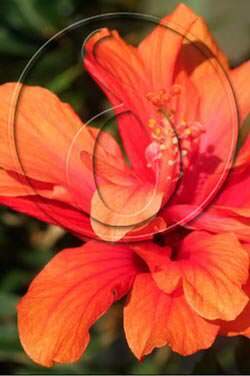 Click the 'Text' tool into roughly the centre of the canvas and type your watermark (Upper or Lowercase to suit you). In the 'Options' bar, click the tick to accept the text. Note, if you are familiar with the 'Text' tools you can try using a 'Return' to stack text over two or more lines and adjust the 'Leading' and 'Letter Spacing' to create a more adventurous watermark. 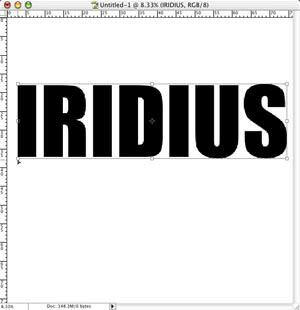 From the 'Edit' menu select 'Free Transform' and using one of the transform corners resize the logo to be as large as possible within the canvas (holding down the 'Shift' key to scale the logo proportionally). In the 'Options' bar, click the tick to accept the transformation. Go to the 'Layer' menu, highlight 'Type' and select 'Create Work Path'. This action converts the text to an outline vector path. 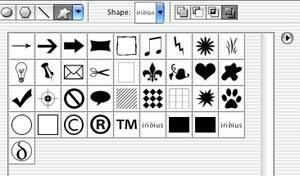 To add the shape the library, choose 'Define Custom Shape' from the "Edit' menu and name the item 'watermark'. Click 'OK'. 4 With our 'Custom Shape' defined we can now begin to create our watermark. Open an image with a typical resolution you consider to be suitable for printing (ideally between 200 - 300 ppi) and crop it to a Height of 6 inches and a width of 4 inches - this will be our test image. 5 In the 'Preferences', check that the 'Units and Rulers' are set to 'Inches'. 'Units' set to 'Pixels' or 'Percent' create a watermark that changes size based on the files resolution and will prove unreliable. 6 Select from the 'Toolbox' the 'Custom Shape Tool' (U), found under the 'Rectangle Tool'. In the 'Options' bar, click on the drop-down menu for 'Shape' and select your shape named 'watermark'. 7 In the image, place the 'Custom Shape Tool' close to the rulers with a small margin of approximately 5mm from the top and left of the document. Holding the 'Shift' key, drag the 'Custom Shape' until it almost fits the width of the photo. 8 From the 'Layer' menu, choose 'New' and select 'Layer'. Name the layer 'watermark' and click 'OK'. 9 Choose from the 'Edit' menu 'Fill', and select the fill 'Contents' to be white. Click 'OK'. 10 From the 'Layer' menu, choose 'Add Vector Mask' and select 'Current Path'. You should now have a white logo in the style of your watermark. 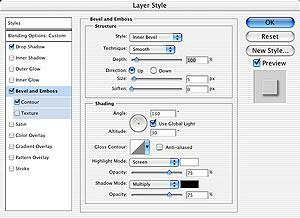 11 Again, from the 'Layer' menu, choose 'Layer Style' and select 'Blending Options'. Many of the attributes added in the 'Layer Styles' dialogue box are resolution dependent. 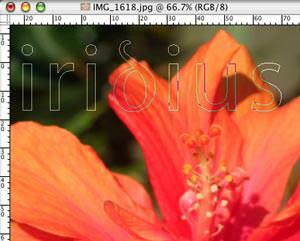 We are creating this watermark for images that have a resolution between 200 - 300 ppi. If you would like to watermark screen resolution images (72 ppi), I would suggest that you create a watermark specifically for that task after. Now, click 'OK' to accept all styles. 13 Optional: From the 'Layers' palette wing menu, you can select 'Flatten Image' leaving the image as a single layer. 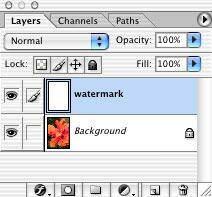 If flattening your layers, ensure that you save the image using 'Save as' from the 'File' menu and create a new file containing the watermark. 14 We have just created our first 'Watermark'. Should you want to create a Photoshop 'Action' that can be used to batch process multiple images applying the watermark technique, repeat the steps 4 -12 recording each step using the 'Actions' palette. 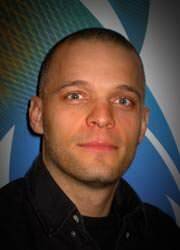 With more than 12 years' experience working with photographers and their images, Terry Steeley is recognised as a world-class Photoshop specialist, having for the past four years represented Adobe as an authoritative speaker at worldwide trade shows and seminars. His passion for photography and enthusiasm for sharing his knowledge has led him to develop his highly-acclaimed courses catering for photographers of all abilities - from the novice and enthusiast to the amateur or semi-professional. Terry's relaxed style ensures that people can easily understand and absorb his knowledge. Covering all aspects of capturing and editing digital images, his teaching blends traditional film techniques with today's modern digital equivalents providing essential viewing for all interested in exploring digital photography. "One of the most natural and gifted presenters of Adobe Photoshop… the audience never fails to be engaged." After the free transform step i i go to the layer option but can't select the 'type' option. Why might this be? any help would be useful. Cheers, Kyle ps. amature user btw. After the free transform step i i go to the layer option but can't select the 'type' option. Why might this be? any help would be useful. i am using this technique for the first time and no matter what font i use for the text to use as the watermark, after i click 'create work path' and define the custom shape, the text still appears filled black rather than just the outline. further on after setting up the blending options the text does not have any shadow and reducing the opacity returns the image to the black filled state described above. i am using CS2, is there any changes i need to make to the steps above to get the same results? Quote: after i click 'create work path' and define the custom shape, the text still appears filled black rather than just the outline. When you say that your text still appears black. is that when you are applying your text custom shape to an image? If so - here's a small description of the probable cause. When you have your custom shape tool selected, you'll see that there are three boxes next to the custom shape in photoshop's option bar, shape layers, paths and fill pixels. If the shape layers box is selected. your custom shape text will fill with your current foreground colour. If you select the paths box, the text will just be an outline like a custom should be, with no fill. And if the fill pixels box is selected, like the shape layers box, your text will again be filled with your foreground colour. Check that the paths box is selected before applying your custom shape. I got it. It's perfect…now how do I make this process an action? That's the question. I'm now going through this same process not too many times but I can see where I might have 30 images that need watemarks for a website. i'm stuck at instruction #10 i can't find 'Add vector Mask' Option anyone know if it could be called something else? hey, im using photoshop 7 and am stuck on the last part of step 3. When i pull down 'layers' and open 'type', the option to 'create work path' doesnt show up. Any advice? Hi there im new to this forum and photoshop. I have made my watermark which I can add to my photo but when I go to save or save as the photo appears in the folder I have taken it from but the watermark which is saved as a shape does not appear on my photo. Is there another way you add it to the image. ? thanks.I am a newbee in [link=http://www.rasteredge.com/how-to/csharp-imaging/create-watermark/]watermarking[/link] with PS. I want learn more from the forum. thanks.I am a newbee in watermarking with PS. I want learn more from the forum. great tutorial.I followed every step and i made my watermark.Now i need to do it on a batch of 100photos.tks a lot! Great tutorial. I also got stuck on Steps 9 and 10, so I just skipped them. I clicked on my Shape layer and chose my blending options and fx from there. It still looked really nice in the end. Thank you for posting this.